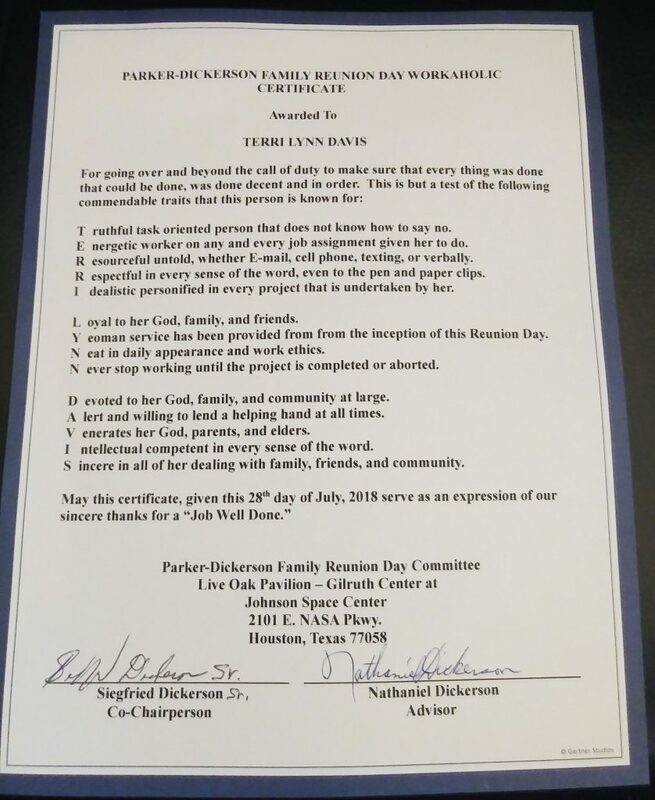 Terri Lynn Davis received this certificate for her devotion to the Parker-Dickerson Family Reunion. She searched the web and found a few great ideas but wants lots more. When she asked, we said we’d ask our readers for suggestions-but only if she shared the ones she’s already collected. These are the ideas Adria already has, plus appropriate gifts for these awards. Traveled the farthest … Big Hair … Most Unusual Career … Giving awards at high school class reunions is a BIG must do. All class reunions need a program. Most commonly classmates get a microphone and engage the group with class-specific memories, insights, illusions or delusions. The reunion committee decides which awards to give and the “flavor.” Sensitive? Afraid that the “Most Changed” award could be hurtful? 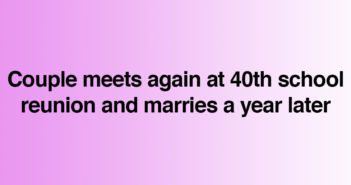 You may not want to give the “Married Most Times” award. Awards can be a big hairy deal! One class committee just gave “Hair” awards because they had one male classmate with new woven hair and they wanted to be sure he got recognized. “Hair Awards” that were used included: No Hair, Big Hair, Same Hair, New Hair, Gray Hair and Hair-that-Traveled-the-Farthest. Censored: Got a classmate who has always been full-of-it? One 30 year class reunion gave a shoe box of doggy do (old and dried up, thankfully) to the honored classmate. I’m still looking for the class that will give the “Woman with the Youngest Husband” award. Somehow it’s not even cute the other way around – a double standard for sure. Use Senior Prom designations instead of “the usual.” King, Queen, Biggest Flirt, Still Most Likely to Succeed. Use your noodle … anything goes. Presentation can be Oscar-like with two different classmates giving each award; draw more classmates to the podium (circumvent old cliques). A handsome bald man can give a Hair Award (I like hair awards) and classmates-married-the-longest can give the Newest Newlywed award. Tradition aside, being able to laugh at ourselves is what this award gig is really about. Kathe Murphy’s Idaho-based, Classy Reunions, Inc. was founded in 1988 and is a member of the National Association of Reunion Managers. The author’s company makes award ribbons (rosettes with class-personalized streamers, $40 for 10 Awards in 2 school colors). There are 30 awards to choose from or make up your own. Call 1-800-544-0194 or e-mail reunions@netw.com. Few reunions miss the opportunity to award special people and deeds. Members of the National Association of Reunion Managers (NARM) are responsible for these suggestions. First or Last to Register, Biggest Lottery Winner, First to Retire, Best Brush with Greatness Story, Turned Out Just as Expected, Still Drives (or is still restoring) the Same Car, and Lives Closest to School. NARM member, Kathe Murphy, Classy Reunions, Inc., Sandpoint, Idaho, has contributed (sometimes dubiously) to this list for us in the past and offers these additions. Never Left Home, Never Married, Woman with the Youngest Husband and Most Body Piercing. Here is a list of awards for our class reunion. But I am having problems trying to find out what kind of gifts to get for the adwards. Maybe someone can help me with the right gifts to give for each award. They are suppose to be funny awards not anything insulting.